Welcome to another edition of The Layup Drill. Have you recovered from the Super Bowl yet? We’ve written about it a lot and now we finally get to look forward to it. Manny Pacquiao will meet Floyd Mayweather, Jr. on May 2nd in Las Vegas. The fight was finally signed, delivered and announced by Mayweather. Although this fight would have been the biggest spectacle in sport about five years ago, it will still deliver for millions of fight fans. It’s clear that Pacquiao has made concessions so that the fight would be made. The most notable was that the two sides agreed upon a 60-40 split of the revenue in favor of Mayweather. Despite the lack of an equal split, Pacquiao should still make a hefty amount of money from the fight. Most odds-makers are picking Mayweather as the clear favorite in this fight as most believe that Mayweather (38), has preserved his body over the course of his boxing career. It is Mayweather’s defensive fighting style that has helped him withstand big shots whereas Pacquiao (36), is a much more aggressive fighter and being knocked out by Juan Manuel Marquez in December 2012 still resonates in the minds of most boxing fans. Rest assured, despite the fight not having the polish it might have had in 2010, these two will still draw a nice crowd, and a very good payday. It’s unlikely that many folks will be able to afford a ticket into the 18,500 plus seat MGM Grand Garden Arena as the cheapest ticket into the fight will be $1,000 with ringside seats going for $5,000 each. Despite the lofty prices, expect a sellout and a gate of $40 million which would set a record for attendance at a boxing event in Nevada. For those of us that can’t fly to Vegas to watch, there is still the pay-per-view option. However, purchasing the event for home viewing will still be a pricey option as the rumors of the event costing between $100-$110 is almost double that of monthly cable bills for many. Despite being an underdog against Mayweather, it goes without saying that Filipinos all over the world will be pulling for Pacquiao. Want to know how serious they are about their national hero? Former University of Kentucky basketball player, Daniel Orton was on a Philippines Basketball League team when he made comments about Pacquiao’s capability as a basketball player. Pacquiao is part-owner and player/coach on one of the teams. While Pacquiao has taken a sabbatical from playing, Orton was quoted as saying that Pacquiao’s basketball play “is a joke.” Poor decision as Orton’s team quickly dismissed him from the team. An official with the team stated that “everyone is angry at him.” The official compared the insult to that of insulting Martin Luther King, Jr. I am not sure if you can compare Pacquiao to the civil rights leader, but the intent is that Pacquiao is that important to the Filipino people. It goes to show that even taking a jab at Pacquiao on the court will still be met with a tough defense. After much flirtation with the idea that the Ultimate Fighting Championships would visit the Philippines, the mixed martial arts company will finally make a long-awaited debut in the country in May. As part of the card, Filipino fighters will be a part of the card so that fans will have a chance to cheer on their countrymen. The UFC is a hotbed in the Philippines with the company receiving a warm welcome every time a fighter comes to the country on a goodwill tour. While the main event will feature two American fighters in the main event, Frankie Edgar and Urijah Faber, expect a raucous Filipino crowd. Notably, Mark Munoz will be a part of the event in Manila. Munoz fought this past February near his home in Southern California. Unfortunately, it was not a good homecoming for the man dubbed “The Filipino Wrecking Machine.” The problems started the day before as Munoz failed to make weight on his first attempt. You might recall Munoz had issues with weight in the past having ballooned up to near 300 pounds. Munoz fights at 185 pounds. Even though Munoz made the required weight limit, he was choked out in the first round in a disappointing performance which saw him mount no offense. With injuries mounting and his skills depleting, it’s easy to see that he is on the down side of his career. Munoz, who is a proud Filipino American, will get another chance in the Octagon. And he’s decided that this will be his last in a fitting ending to his career. For a fighter that’s been proud of his Filipino heritage, his fight this May will be his last. Hopefully, he can end his career on a winning note. Lin mounting comeback in second half but is it too late? I had the unique opportunity to cover an NBA game, a rarity for those still hoping for the Sonics to return to Seattle. I traveled down I-5 in early February to watch the Los Angeles Lakers play the Portland TrailBlazers in the Moda Center (formerly known as The Rose Garden). The main reason was to see Jeremy Lin in person. The player formerly known as “Linsanity” has been less than himself since leaving New York three years ago for the Houston Rockets. In the offseason, he was traded to the Los Angeles Lakers. On this night, he was coming off the bench, his new role for the Lakers. Lin did not have a very good game against the Blazers. His shots were all fading away and he finished with just 2 points from free throws and no actual shots made. 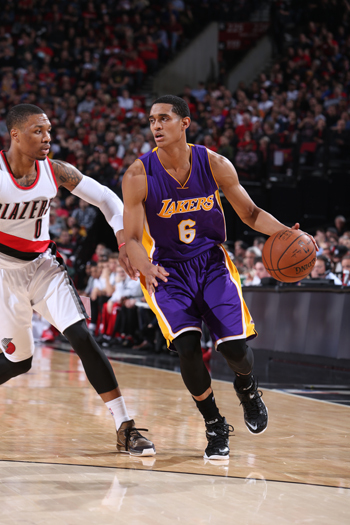 In the same game, Laker rookie Jordan Clarkson showed that he is a player that the team could look to in the future. Clarkson, whose mother is Filipino, has seen his minutes increase and has taken advantage of his opportunity to play. Since watching the two play in Portland, Lin has improved. His production is much better and he’s shown signs of being that stable point guard that Coach Scott is looking for. But, ironically, Clarkson’s play may actually mean the end of Lin’s time in Los Angeles. The sheer economics of it is that Lin makes a lot more money than Clarkson. As a free agent after the season, Lin will likely have to take a pay cut from his loft salary of almost $15 million per year to find another job. The Lakers pay Clarkson under $1 million, which is very cheap when talking about paying NBA players.